Can you imagine how frustrating and confusing it would be to find several variations of the same agency name on different sites or even different pages or documents on the same site? This is what happens everyday to Spanish-speaking customers accessing the Spanish names of some federal agencies. They try to navigate the website to perform important tasks like applying for benefits, accessing health information, doing business over the Internet or filling out forms. How can they be sure they are on the official government site? Until now there was no consistency or standards for how to translate the names of federal agencies. And sometimes the translated names misrepresented agencies’ missions and services. It’s easy to see how this could happen when there are 20 countries that speak Spanish, with a variety of regional differences. And there has been no central guide for translators to check. 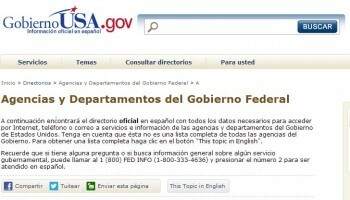 But the USAGov en Español (formerly known as GobiernoUSA.gov) team from GSA, as part of its mission to support access to government information for those with Limited English Proficiency, set out to address this need. They sought the help of the North American Academy of Spanish Language, the institution responsible for maintaining Spanish-language standards in the U.S., to create the Official Directory of Spanish Names for Federal Agencies. It was the first formal project they tackled under their 2012 renewed agreement to help standardize and improve the use of the Spanish language in federal government communications. This directory not only provides better customer service for the public because it standardizes agency names for translators, interpreters, educators, and the media to use, but it will save agencies time and money in correcting the erroneous terminology. So distribute this resource to your translators and anyone working on your Spanish site, then make sure your website has the official Spanish name, and see the confusion start to disappear. And there’s more to come. As part of efforts to improve content for those with Limited English Proficiency, we’ll be looking at Plain Language later this year. So stay tuned and get involved with the Government Multilingual Websites Community!